John San Juan (left) joins Phil Angotti (center) and Friends for a Squeeze number. Photo by Ari Shagal on John San Juan’s Facebook page. It would have been possible in Chicago this past weekend to go from bar to bar checking out rock band tribute shows, much like kids trick or treating in their neighborhood. The Montrose Saloon, Live Wire, Martyrs’, and Subterranean were just a few of the venues presenting local musicians covering famous ones. It would have been great to go to them all, but due to a hectic schedule, I was only able to drop by Martyrs last Saturday night. In keeping with the holiday, a few of the acts had tricks up their sleeves. John San Juan and his band’s set was listed as an Eddie Money tribute but anyone hoping for “Two Tickets To Paradise” would have been waiting so long to hear that or any other Money material. That’s because San Juan instead performed songs by the less commercial but catchy and engaging Teenage Fanclub. Phil Angotti and Friends delivered a set of Squeeze hits as promised, and captured the sophisticated pop of “Black Coffee In Bed,” “Take Me I’m Yours,” “Tempted,” and “Up The Junction.” Still, the biggest treat from his set might have been the lesser known but irresistible “Messed Around.” Angotti also brought up guest musicians to augment the first-rate ensemble he had already hand-picked. Like John San Juan, The Differents were in prank mode that night, but their idea was well-executed and clever enough to ensure nobody would complain. They promised a.m. radio hits, which for most people would mean the 1950s and 60s. Instead, they covered alt rock songs that were released long after the a.m. dial became infested with talk radio. An onstage announcer claimed the show was being broadcast live, and used the distinct patter of an old time disk jockey to describe the proceedings (“That was The Differents covering The Jam on ‘Start’”). Comprising singer-guitarist Lou Hallwas (who had been one of Angotti’s guests) vocalist bassist Gary Stier, and drummer Dan Garrity, the band also covered The Pretenders’ version of “Stop Your Sobbing” and also roughed up Freda Payne’s “Band Of Gold.” Angotti climbed onboard to sing lead and play guitar on Tom Petty’s “American Girl,” and by the time The Differents blasted through Harry Nilsson’s “Jump Into The Fire” and Cheap Trick’s “Southern Girls,” there were a number of guest musicians joining in on the fun. Sadly, that was as much of the party I caught at Martyrs’ since it was almost midnight and I had to make the long public transportation trek back to Palatine. 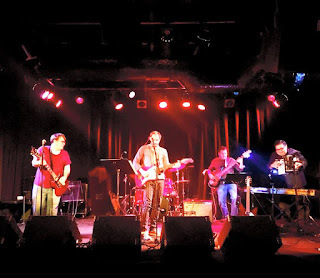 The Flat Five has been called a Chicago super group due to members Casey McDonough, Kelly Hogan, Scott Ligon, Nora O’Connor, and Alex Hall being veterans of the local music scene and beyond. There’s a vintage quality to their music that includes silly lyrics, smooth-as-silk crooning, jazz beats, and occasional Latin rhythms. 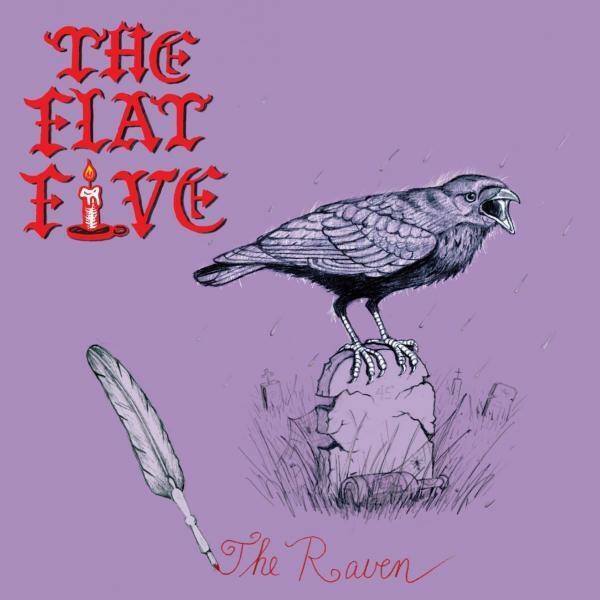 After years of performing together on an irregular basis, The Flat Five surprised its fans with a full-length debut last year. That entertaining vibe of It’s A World Of Love And Hope continues on the band’s recent 45 rpm, colored vinyl single “The Raven.” The members sing Edgar Allan Poe’s words verbatim to finger-snapping arrangement with keyboards and percussion. It’s tempting to think the melody crafted by The Flat Five could be more adventurous, but that approach might have obscured the fun of turning one of the most chilling poems ever written into an irresistible Halloween party song. “The Raven” can be ordered on vinyl or downloaded via the Bloodshot Records site. A warm Broken Hearted Toy welcome to the iconic Bob Dylan, who’s in town for a WXRT concert tonight at the brand new Wintrust Arena on the lakefront. Chicago’s own legend Mavis Staples will also be performing, which makes this a potent double bill. Dylan is on the cover of a new Heritage Auctions catalog I just received in the mail. I’m only familiar with Heritage because the company usually has reps at Fest For Beatles Fans, and they’re very friendly. Their Music and Entertainment Memorabilia Signature Auction coming up live in Dallas and online on November 11 includes a “Bob Dylan owned and stage-played 1963 Martin D-28 acoustic guitar used on stage at George Harrison’s Concert For Bangladesh and the Rolling Thunder Review Tour.” There are also items related to The Beatles, The Rolling Stones, Billie Holiday, Pink Floyd, The Who, Led Zeppelin, and Marilyn Monroe. The opening bid on the Dylan guitar is $300,000. 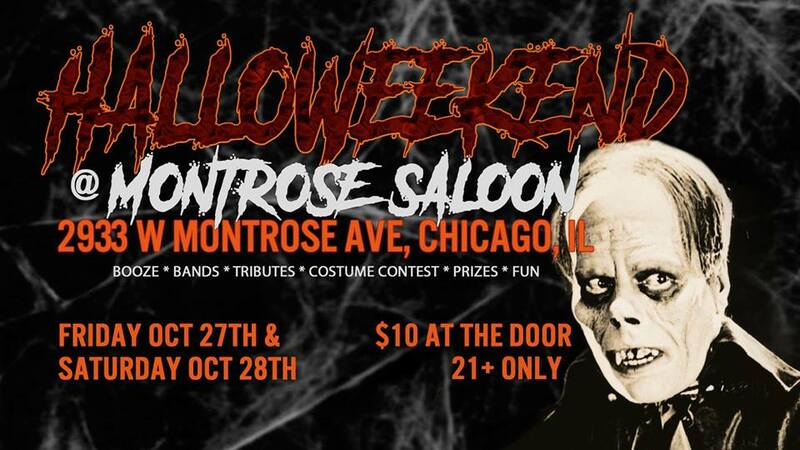 Halloweekend, the annual two-night tribute event that offers at least four bands doing short sets each night, kicks off at Montrose Saloon tonight. Depending on what time you read this, you could catch part of tonight’s like up of Shoeless Joe Jackson as Joe Jackson; Statutes Of Libery as Grand Funk Railroad, Phil Angotti as The Animals; Rachel Drew covering The Pixies; and The Big Parade & Ary Jeebie as Alice Cooper. Tomorrow night, Decoy Prayer Meeting pays homage to Tom Petty; The Webstirs will be The Guess Who; Androgynous Moustache performs as Crowded House; and Charlie Short will be Robert Palmer. Montrose Saloon is located 2933 W. Montrose. There’s also a tribute show going on at Subterranean tonight, as part of a benefit/tribute fest for the Intonation Music charity. The Handcuffs will be playing George Harrison tunes; Dayton will play The Rolling Stones; The Good will perform as Queen; Kid Million will do Jane’s Addiction; The Cell Phones will play Lesley Gore; and Que Rico will perform as Toto. If you’d rather be the one belting out tunes by famous (albeit no-longer-with-us) musicians, then FitzGerald’s in Berwyn would be the place for you tomorrow night. That’s when the venue is holding a Ghosts Of Rock Stars Past Halloween Costume Party – Lip Sync Battle And Dance Party. The Safes, a Chicago-based band whose punk-inflected indie rock albums have been favorably reviewed here on BHT, have a record release party for their new release Tasty Waves coming up at Beat Kitchen on November 22. The Differents, Little Boy, Jr., and The Hustle are are also on the bill that night. The Bangles, The Romantics, A Flock Of Seagulls, Violent Femmes, Nick Heyward, Boy George And Culture Club, Salt N Peppa and Adam Ant will all be on the bill at the Totally 80s Live Show coming up on January 26 at the Honda Center in Anaheim, CA. Congratulations to my nephew Joe Flamm on being chosen as one of the contestants for the upcoming season of the Bravo Channel’s Top Chef program. Joe is currently the chef at critically acclaimed Spiaggia on Michigan Avenue. Our family is extremely proud of him. A tip of the cap to Chicago Cubs first baseman Anthony Rizzo on proving once again that he’s first-class guy. Rizzo, who has battled cancer himself, had already sent 12-year-old Abby Schrage an autographed picture to help her cope with her treatment for brain cancer. When the news broke that Schrage was devasted after the photo was stolen from her hospital room, Rizzo sent another signed photo, a signed jersey, and some tickets so she and her family can go to the Cubs’ 2018 season opener. Just when you thought they might be dead (pronounced ‘did’ with A New Zealand accent) The Flight Of The Conchords have announced upcoming concerts in Ireland and the U.K. According to posts on Facebook, the March/April 2018 shows sold out almost immediately. A super hectic schedule last week decimated my blogging output, resulting in missed opportunities for promoting some worthwhile events. I even neglected to mention Elgin’s annual Nightmare On Chicago Street Halloween Festival, which was held in the city’s downtown area last Saturday. Jeff Kelley and Dave Metzger once again created a zombie-related comedy/thriller to be screened as part of the festivities. I have a small part in their new The Elgin Dead film, which makes my failure to mention it here even more glaring. At least I can mention that The Elgin Dead can be seen on YouTube. The Fall issue of Inspirer came out before the 2018 nominees for the Rock And Roll Hall Of Fame were announced but the magazine and the Hall seem to be somewhat on the same wavelength. Inspirer, which is dedicated to covering women in music and entertainment, ran a feature titled Rock And Roll Hall Of Fame, Induct These Women. Three of their suggestions—Nina Simone, Kate Bush, and Chaka Khan are among this year’s nominees. Inspirer’s RRHOF recommendations also included The Runaways, Janet Jackson, The Go-Go’s, PJ Harvey, Pat Benatar, Lucinda Williams, and Carole King. Belly, of “Feed The Tree” fame, has launched a Pledge Music campaign to help with the release of its long-awaited third album. Those who sign up for the yet-to-be-titled effort will have access to exclusive merchandise like signed vinyl, posters, and special show passes. Dating back to the days of Crosby, Stills and Nash and Blind Faith, it’s always been fascinating to discover the chemistry that happens when members of various bands join together to start a new project. 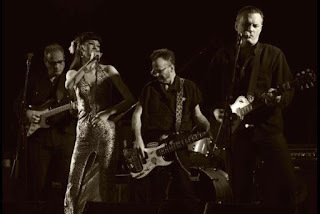 In Chicago, the recently formed trio Sunshine Boys comprises Freda Love Smith from Blake Babies; Dag Juhlin from The Slugs; and Jacqueline Schimmel from Big Hello. Blue Music, their debut release of hard-hitting but consistently melodic songs is due out early next year and they open for Poi Dog Pondering (another band Juhlin is part of) on December 30 at City Winery Chicago. Back in 2015, members from the Love Me Nots and Wooly Bandits joined forces for an impressive and fun new garage rock band called Motobunny. The Small Square combines Paul Chastain, who co-founded The Velvet Crush with Ric Menck, with John Louis Richardson who currently performs with Shoes. The resumes for both musicians include time spent with Matthew Sweet, Tommy Keene, Susanna Hoffs, Joey Molland, Ric Menck, Roger McGuinn, and Mitch Easter. The Small Square’s new single “Open Up” is a power pop gem gleaming with the unmistakable presence of guest musicians Jeff Murphy, John Murphy, and Gary Klebe from Shoes. 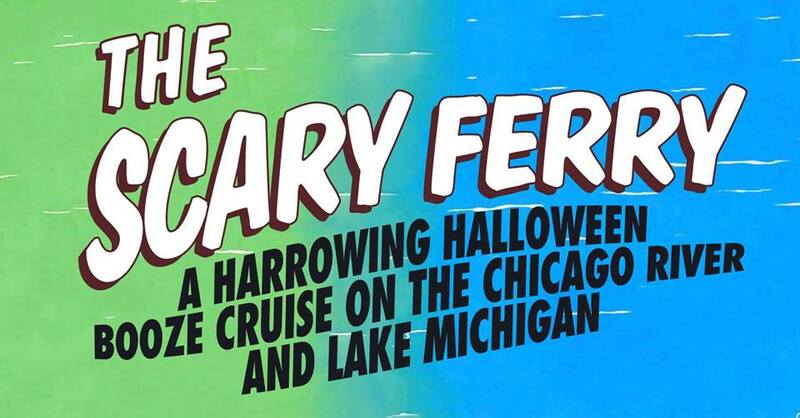 The Scary Ferry - A Maritime Masquerade On The Chicago River and Lake Michigan will feature Archie Powell And The Exports, who’ve racked up some rave album reviews here on Broken Hearted Toy, along with Family Of Geniuses, and Band From The Back Porch this Friday night. In addition to live music, there will be costumes and prizes. The fun starts at 7:30 p.m.
Here’s an addition to yesterday’s You Be Me For A While post about upcoming tribute band shows: The Fab Four will be performing Beatles songs this Friday, October 27 at Star Plaza Theatre in Merrillville, IN. It’s not related to Halloween, these guys do this stuff all the time. A super hectic schedule last week decimated my blogging output, resulting in missed opportunities for promoting some worthwhile events. I even neglected to mention Elgin’s annual Nightmare On Chicago Street Halloween Festival, which was held in the city’s downtown area on Saturday, October 21. Jeff Kelley and Dave Metzger once again created a zombie-related comedy/thriller to be screened as part of the festivities. I have a small part in their new The Elgin Dead film, which makes my failure to mention it here even more glaring. At least I can say that The Elgin Dead can now be seen on YouTube. Halloween will soon be upon us, and along with costumes, trick or treating, and apple bobbing, that means several local bands will be doing tributes to rock stars in local clubs. At least in Chicago. Here’s a quick look at who’s becoming who this weekend and through All Hallows Eve. I’m pretty sure there are more tribute shows than I’m listing below, and if I find out about them (or someone contacts me), I’ll be sure to post them. 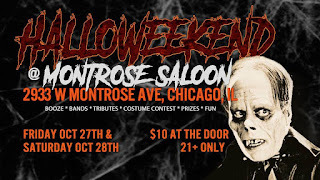 Halloweekend, a two-night event with at least four bands doing short sets each night, lands at Montrose Saloon this year, after having been staged at Martyrs’, The Abbey Pub, Quenchers Saloon, and other locations in the past. On Friday, October 27, Shoeless Joe Jackson will perform as Joe Jackson; Statutes Of Liberty rock out as Grand Funk Railroad, Phil Angotti will lead a pack of musicians performing as The Animals; Rachel Drew will cover The Pixies; and The Big Parade & Ary Jeebie wrap up the evening as Alice Cooper. On the Saturday night, Decoy Prayer Meeting pays homage to Tom Petty; The Webstirs will be The Guess Who; Androgynous Moustache performs as Crowded House; and you might as well face, Charlie Short will be Robert Palmer. Montrose Saloon is located 2933 W. Montrose. 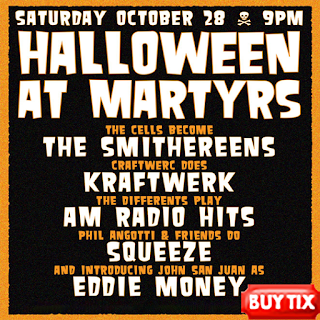 The Martyrs’ venue, at 3855 N. Lincoln Avenue, has five bands doing tributes on Saturday, October 28. 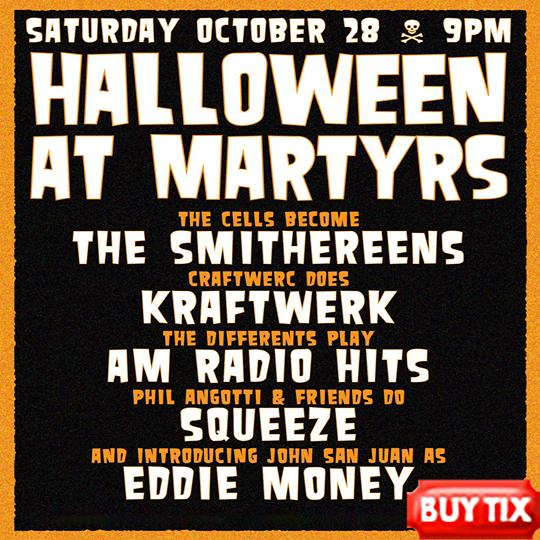 The Cells will be performing as The Smithereens; Craftwerc will have fun fun fun on the autobahn doing a Kraftwerk tribute; Phil Angotti and Friends will perform as Squeeze, The Differents will be playing AM Radio Hits; and John San Juan will be doing the songs of Eddy Money. On Halloween night at Martyrs, Creampuff Warriors will perform as The Grateful Dead, and Murley will be The Allman Brothers. 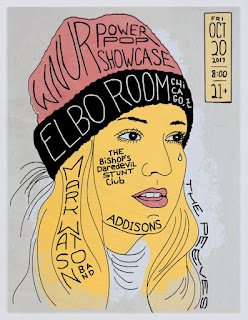 On Friday night, Subterranean (2011 W. North Avenue) is hosting a benefit/tribute fest for the Intonation Music charity. The Handcuffs will be playing George Harrison tunes; Dayton will play The Rolling Stones; The Good will perform as Queen; Kid Million will do Jane’s Addiction; The Cell Phones will play Lesley Gore; and Que Rico will perform as Toto. If you’d rather be the one belting out tunes by famous (albeit no-longer-with-us) musicians, then FitzGerald’s in Berwyn would be the place for you on Saturday. That’s when the venue is holding a Ghosts Of Rock Stars Past Halloween Costume Party – Lip Sync Battle And Dance Party. 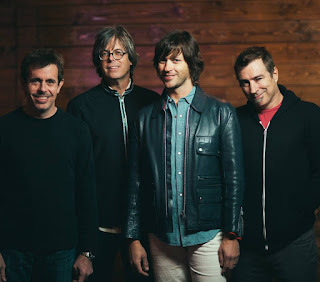 The Old 97s have visited the Chicago area several times over the years, but this past Saturday night’s performance at Durty Nellie’s was their first in suburban Palatine. Likewise, Durty Nellie’s doesn’t often book nationally known, critically acclaimed acts like The Old 97s. This rare occurrence worked well for both parties, as a packed house enjoyed 90 minutes of rollicking country flavored alternative and garage rock. Hearing audience members singing along to the fun and catchy “Barrier Reef,” it seemed likely long-time fans had traveled from afar to catch this show. Newcomers were no doubt easily converted as The Old 97s tore through a mix of high-speed rock songs and boozy ballads drawn from their latest effort Graveyard Laughing and 11 previous albums. Lead vocalist-guitarist Rhett Miller was a charismatic frontman who consistently fed off the crowd’s enthusiasm, while guitarist Ken Bethea provided plenty of firepower and twang. Opening act Lily Hiatt, daughter of John Hiatt, joined the quartet (bassist Murry Hammond and drummer Philip Peeples are the rhythm section) for “Good With God” from Graveyard Laughing, swapping vocals with Miller. (Brandi Carlile sings on the recorded version.) The set also included “Champaign, Illinois,” a funny tune that has received a lot of airplay on Chicago station WXRT. The Old 97s returned for a trio of encores that kicked off with the touchingly romantic “Question” before blazing away on “Let’s Get Drunk And Get It On” and “Time Bomb.” After The Old 97s had finished, a guy standing nearby turned to me, and with a childlike sense of urgency said, “I want more!” Exactly. P.S. Due a dinner engagement, I didn’t arrive at Durty Nellie’s until after Lily Hiatt’s opening set, but I did talk to her at the merch table and she was very friendly and cool. The Old 97s are performing at Durty Nellie’s with Lily Hiatt as their opening act in Palatine tonight. Despite its first-rate acoustics and a classy décor, this venue relies too much on local cover bands. So an adventurous move like this should be rewarded with a packed house. Led by lead vocalist Rhett Miller, the band formed in Dallas, TX back in 1993 and has released 11 studio albums. The online rock publication Paste describes The Old 97s as “one of the few bands that have never really put out a bad record.” Their latest non-bad effort, Graveyard Whistling, came out earlier this year. This Is This, a local band that took its name from The Deer Hunter and who recorded a couple of albums of catchy originals, will be doing its final show tomorrow night at the new Buffalo Creek Brewing venue in Long Grove. Last night’s Slumgullion had to be postponed because I was at at Filament Theatre watching Tellin’ Tales Theatre’s original Halloween-style musical comedy Six Stories Up – In Haunted Chicago. It concerns middle school kids encountering some famous Chicago ghosts while on a field trip ad wraps up its run this weekend. Filament Theatre is located at 4041 N. Milwaukee Avenue. The 53rd The Chicago International Film Festival s running through October 26 at AMC River East 21, just north and east of downtown run area. The Dayna Clay Project will host the Unplugged: A Survivor’s Story In Scenes And Songs Book And Album Release - Benefit Show this Sunday, October 22 at City Winery Chicago. The event starts at 1:00 p.m. According to the Chicago Tribune, the book was inspired Kurt Cobain. Destinos, the first Chicago International Latino Theater Festival continues this weekend, and runs through October 29 at various venues in town. WNUR 89.3 radio personality Kirk Fox will bring the second installment of The Power Pop Shoppe Showcase to the Elbo Room on Lincoln Avenue tomorrow (Friday) night. Fox plays a variety of artists on his Power Pop Shoppe program, and so far, the live shows have been adventurous as well. Last March, The PPSS gave us a triple bill of singer-guitarist Phil Angotti, the quirky band The Bishop’s Daredevil Stunt Club, and The Sunshine Boys—a new energetic, politically aware trio comprised of music scene veterans. The Bishop’s Daredevil Stunt Club, whose latest album Don’t Buy This Record follows in the tradition of fellow Midwestern acts Wilco and The Webstirs, are coming back for The Power Pop Shoppe Showcase Vol. 2. Two of the other bands on the bill, The Addisons and The Peeves, lean more toward an aggressive punk band, while The Mark Watson Band draws on Cheap Trick and Fountains Of Wayne for influences. It will be interesting to see if Fox once again requests that each act perform a cover of a power pop classic. 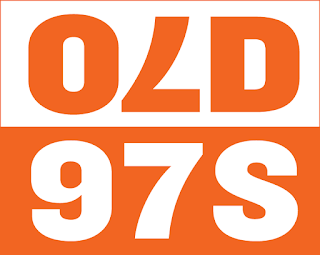 The Showcase kicks off at 8:00 p.m.
Alt rock fans in Palatine and neighboring northwest suburbs have to be thrilled to find The Old 97s are booked for Durty Nellie’s this Saturday night. The venue has first-rate acoustics and a classy décor, but generally makes its bread and butter on local cover bands. This is definitely a bold move that should be rewarded with a packed house. Led by lead vocalist Rhett Miller—who’s also released a few solo efforts—the band formed in Dallas, TX back in 1993. Over the course of 11 studio albums (and a few live ones), they crafted critically acclaimed alt rock/country classics like “Timebomb,” “Buick City Complex,” “Barrier Reef,” and “What We Talk About.” The online rock publication Paste describes The Old 97s as “one of the few bands that have never really put out a bad record.” Their latest non-bad effort, Graveyard Whistling, came out earlier this year. Photo from The Amazing Heeby Jeebies Facebook page. The Martyrs’ venue on Lincoln Avenue has been on a roll lately, with upcoming shows like The Vulgar Boatmen, Walter Salas-Humura from The Silos, and The Sunshine Boys on Thursday, October 19; Expo ’76 with The Total Pro Horns, Robert Cornelius and Susan Voelz on October 20; and a Halloween show featuring The Cells as The Smithereens, Craftwerc, The Differents, and Phil Angotti and Friends as Squeeze on October 28. A recent four-band showcase proved to be a major success for each of the acts involved. On a bill that already offered a variety of musical styles, Samson The Aviator jumped from one genre to another within a single set. Fronted by powerful vocalist Aubrey Thornton, the quartet embellished heavy songs with serious jamming, but also did well with alt rock numbers.Thornton was particularly impressive on a rapid-fire punk song. 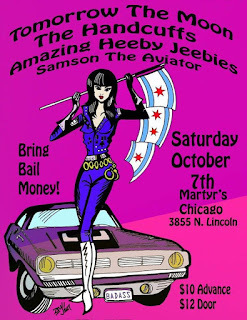 The Amazing Heeby Jeebies offered original rockabilly/garage rock tunes, and also covered songs by Little Richard, The Sonics and Roky Erickson. Ary Paloma Jeebie is a versatile lead vocalist, with a stage presence that taps into 1960s a-go-go with a hint of Salome. Guitarists Bob Hyatt and Tommy “Boss X” Klein provided loads of firepower on songs like “Bad Feeling” and “She’s Just A Woman.” The Amazing Heeby Jeebies have a new album coming out soon. Lead vocalist Chloe F. Orwell jokingly complained about following the charismatic Amazing Heeby Jeebies, but The Handcuffs, which also includes drummer Brad Elvis, easily won over the crowd with energetic and catchy tunes like “Miss You On Tuesday.” Orwell engaged the crowd in some raucous call-and-response singing on “Everybody Waves Hello” and “Gotta’ Problem With Me?” The Handcuffs are currently working on a new album. Unfortunately, I had to leave in order to catch a bus and train back to Palatine, so I only saw one song by sci-fi rock band Tomorrow The Moon. 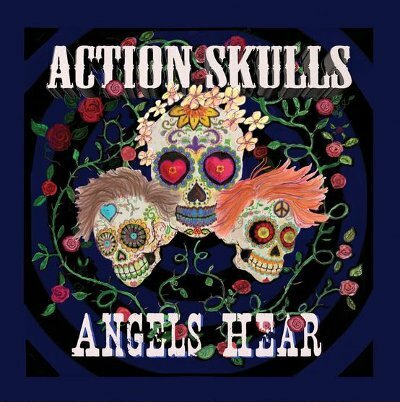 But it was a prime example of the imaginative and powerful rock they’ve created on their recordings, and I’m hoping to catch a full set at some point. The Logan Center Blues Fest takes place this weekend at the Reva and David Logan Center For The Arts At The University Of Chicago. The event includes workshops, film, live performances by Elvin Bishop, Eddy Clearwater, Lil’ Ed, Jimmy Johnson, Corky Siegel, Kenny “Beedy Eyes” Smith, and others. 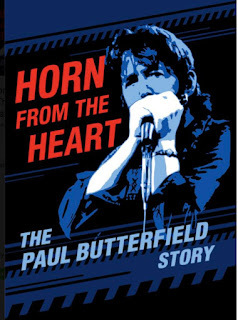 On Sunday, the Logan Center Blues Fest will co-present with CIMMFest the midwest premiere of the director John Anderson’s documentary Horn From The Heart: The Paul Butterfield Story. 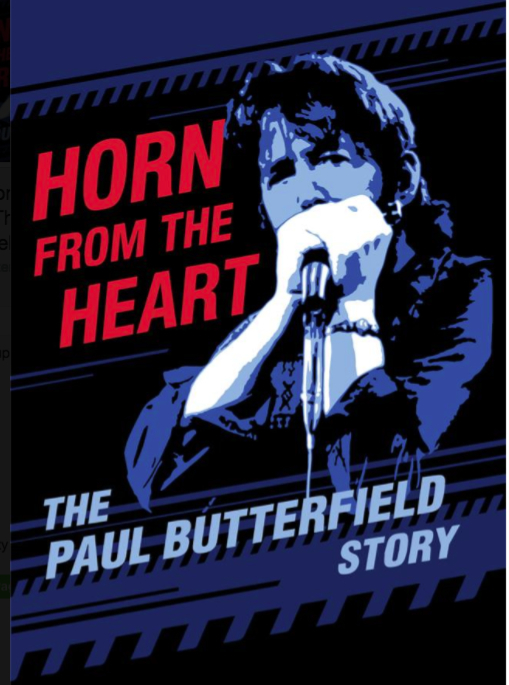 The film, which features David Sanborn, Bonnie Raitt, B. B. King, Bob Dylan, Maria Muldaur, Al Kooper, Corky Siegel, Elvin Bishop, Todd Rundgren, Anton Fig, and other musicians, has been raking in awards on the independent film circuit. Tickets are now on sale for The Zombies shows on March 19 and 20 at City Winery Chicago. Hopefully, by that point, they will have been inducted into the Rock And Roll Hall Of Fame. The 53rd Chicago International Film Festival is running through October 26 at AMC River East 21, just north and east of downtown run area. Destinos, the first Chicago International Latino Theater Festival continues this weekend with Aguijon Theater’s production of Death And The Maisen at Steppenwolf’s 1700 Theatre, The Rojas Projects’ production of Growing Up Gonzalez at Victory Gardens Theater. Chicago International Latino Theater Festival runs through October 29 at various venues in town. Middle school kids on a field trip encounter some of Chicago’s most famous ghosts in the new musical comedy Six Stories Up – In Haunted Chicago being staged by Tellin’ Tales Theatre. According to director/performer Tekki Lomnicki, it’s “a hilarious and thoughtful original musical featuring kids and adults with and without disabilities.” And the spirits (including Lorraine Hansberry and John Belushi) have a lot to say about the current state of Chicago. 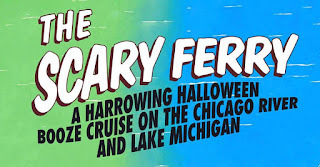 It runs this weekend and next weekend, at Filament Theatre, 4041 N. Milwaukee, Chicago. The recently released 2-CD/2-LP For Sale - Live At Maxwell’s 1986 by The Replacements captures an 83-minute performance by the incendiary band back in its heyday. The set list includes “Hold My Life,” “Can’t Hardly Wait,” and “Kiss Me On The Bus,” along with cover versions of The Beatles’ “Nowhere Man” and The Sweet’s “Fox On The Run.” A full-page ad in Magnet magazine notes: The Replacements’ First Official Live Album (. . . recorded in front of more than 30 people). That same issue of Magnet has an interesting feature on Elizabeth Ziman of Elizabeth And The Catapult, about their new Keepsake album. I still have fond memories of the group’s debut Taller Children and the lush indie ballad “Rainiest Day Of Summer” in particular. The Vulgar Boatmen, a critically acclaimed Chicago band since the late 1980s, have a show coming up at Martyrs’ next Thursday, October 19. Walter Salas-Humura from The Silos is also on the bill, along with The Sunshine Boys, a new trio composed of Freda Love Smith from The Blake Babies, Dag Juhlin from The Slugs and Poi Dog Pondering, and Jacqueline Schimmel from Big Hello. The Sunshine Boys just posted on Facebook that their debut album will be out in early 2018. Dag Juhlin returns to Martyrs’ the next night, October 20, for a show with his eccentric covers band Expo ’76, backed by The Total Pro Horns, and with special guests Robert Cornelius and Susan Voelz. Rebecca Toon and Tommi Zender, will be performing Joni Mitchell’s entire Court And Spark album at Wishbone North next Thursday, October 19 as part of the restaurant’s Third Thursday series. Zender arranged the songs for acoustic guitar. The Collectors have a show coming up at the Cubby Bear in Wrigleyville next Friday, October 20. Erica Loftus of the band The Right Tidys, will be helping out on backup vocals. The Ars Nova and Superbig will also be on the bill that night. 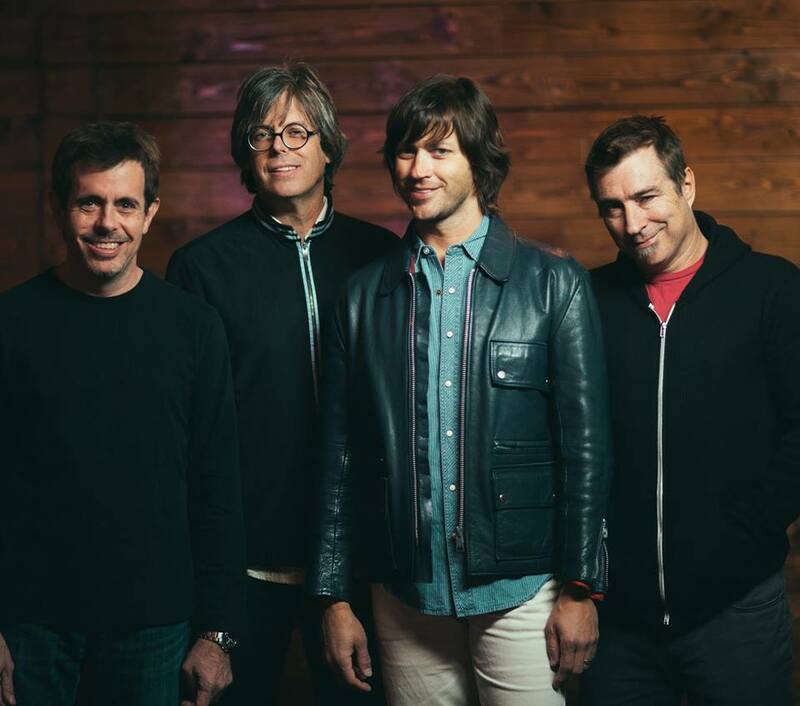 The critically acclaimed alt rock Americana band Old 97s will be at Durty Nellie’s in Palatine on next Saturday, October 21. 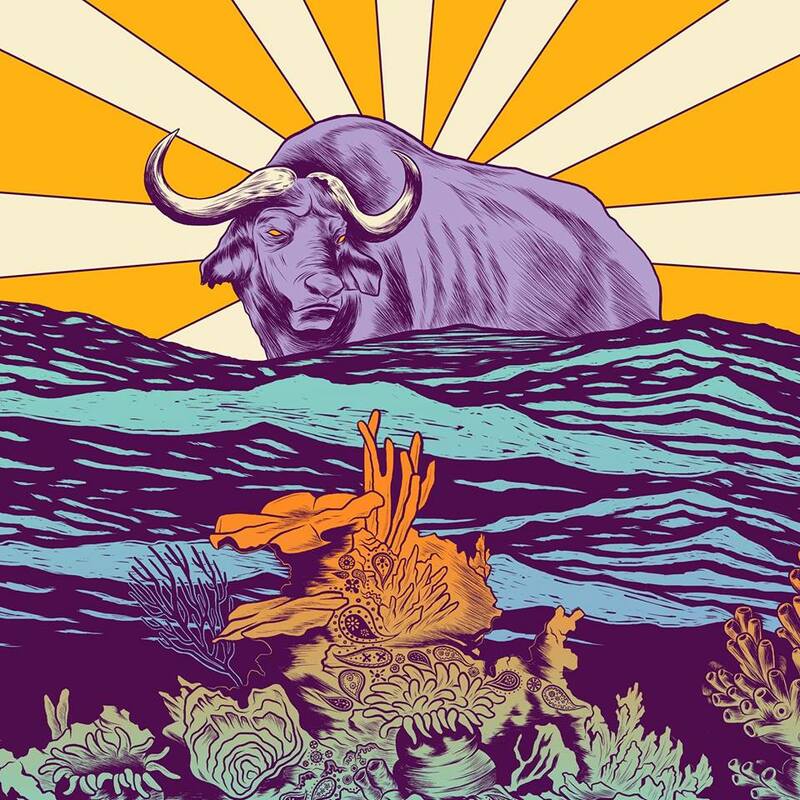 Formed in Belfast back in 2015, Buffalos Bay gained fame in Ireland after releasing the catchy and satiric single “In The Factory” at the start of this year. Their six-song EP Living Under The Reef just came out and it’s immediately evident why these guys claim The Kinks and The Bee Gees as major influences. Though the emphasis is on 1960s style pop, there’s also a hint of country and western twang from time to time. “In The Factory,” with its “Muswell Hillbillies” twang and lines like, “always sipping tea, only thinks that he’s happy,” has already illustrated how much Buffalos Bay admires the way Ray Davies can wrap stinging social observations within irresistible melodies. “In Response,” “Make A Wish,” and “Portraits Of Polly” recall the delicate melodies of early The Bee Gees and showcase the harmonies of lead singer-bassist Stuart Miskelly, and rhythm guitarist-vocalist Andy Bell. “Weeping Onion,” which is actually a happy love song, even offers that off kilter approach to lyrics often taken by the Brothers Gibb. “Early Morning Fry,” like “In The Factory,” uses a toe-tapping country and western arrangement. The title meal is apparently a sort of breakfast sandwich people eat on farms, and the joke here is that it can make you feel better no matter what goes wrong in your life. 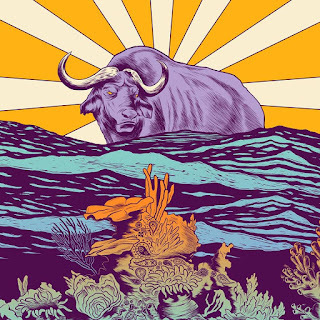 While everything on Under The Reef is well crafted and catchy, it would be nice to see Buffalos Bay expand its repertoire with a few more energetic songs next time out. First, a quick message before moving on to the review. Cordial Sins, a Columbus-based, seven-piece alt rock band fronted by vocalist-synth-violin player Liz Fisher and vocalist-guitarist Corey Dickerson, have an in-store appearance coming up this Friday at the RPM Music Chicago record store. The musicians were in town for Riot Fest (attending, not performing) and during a visit to the RPM store, asked the owner if they could perform there during their next tour. I discovered the store myself last Saturday night before the Tomorrow The Moon, Handcuffs, Amazing Heeby Jeebies, and Samson The Aviator show at Martyrs, and was impressed with the selection. RPM Music Chicago is located at 1839 W. Irving Park Road; the Cordial Sins gig on Friday starts at 7:00 p.m. Always Here is the first Fruits de Mer effort from Stay since the Barcelona-based group released Mersey Dream on the U.K. label some years back. Like that record, Always Here is an EP that’s only available on colored vinyl. This time out though, Stay adds two original tracks to go with its cover versions of 1960s gems. 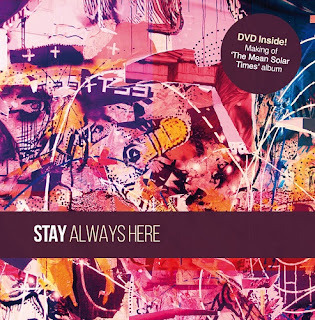 It arrives at a time when Stay has also released a full-length effort titled Mean Solar Times on Picture In My Ear Records. Although brand new, the melodic title track “Always Here” exudes the peaceful vibes and psychedelic instrumentation of late 1960s rock. It offers a message of support, as well as the intriguing line, “I need another angel, but my heaven isn’t here.” The other original, “You Know It’s Right,” also proves Stay has learned a lot from listening to music from that era, as its jangling guitars and lush harmonies evoke The Byrds. A faithful (pun intended) take on “Every Christian Lion Hearted Man Will Show You,” from the first Bee Gees album, proves these guys even know the more obscure stuff. They don’t duplicate the original’s monk chanting, but some organ playing adds a church element. Keyboards also figure prominently in a rollicking version of The Kinks’ “Where Have All The Good Times Gone?” as well as a cover of “Rock And Roll Woman” that does Buffalo Springfield proud. The 53rd Chicago International Film Festival runs from this Thursday through October 26 at AMC River East 21, just north and east of the downtown area. In addition to screening movies from every imaginable genre and location, the event will offer tributes to Patrick Stewart of Star Trek: The Next Generation and X-Men fame, and iconic English actress Vanessa Redgrave. Regular screenings are $15; special presentations are $20; there are discounts for seniors or students; and multiple-show passes are available. The Laureates have a rare live gig coming up this Thursday night at The Empty Bottle. The Chicago-based band has successfully drawn upon UK acts like The Who and The Kinks for inspiration on three full-length albums and a pair of EPs, and will have a new effort titled And Then Not Even Then available on Bandcamp earlier that day. A video for the song “Toys” (be forewarned, several were harmed during the filming) showcases lead singer Chad Preston’s distinctive vocals and The Laureates’ signature jangling guitar sound. Cross Country and Innkeepers are also on the bill this Thursday at The Empty Bottle. Also on Thursday, Music On Stage begins its run of Little Shop Of Horrors at Cutting Hall in Palatine. Broadway actress and Tony Award nominee Felicia P. Fields will be providing the voice of Audrey II, and the play will be directed and choreographed by Frank Roberts, with musical direction by Bobby Dietz. 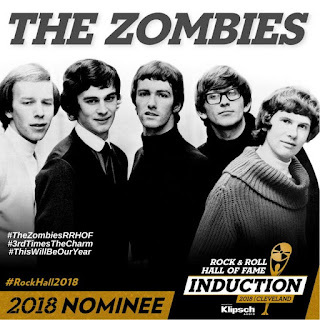 The recently announced 2018 Rock And Roll Of Fame nominees form a 19-artist list that reaches back to 1930s gospel singer-guitarist Sister Rosetta Tharpe and includes mainstream rock, new wave, rap, British Invasion, jazz, funk, reggae, heavy metal, techno, and prog rock. A good case could be made that most of these act were catalysts of their particular genre—The Meters, Judas Priest, Rufus featuring Chaka Khan, Nina Simone, Link Wray, LL Cool J, Kate Bush, The Moody Blues—as well as being popular. 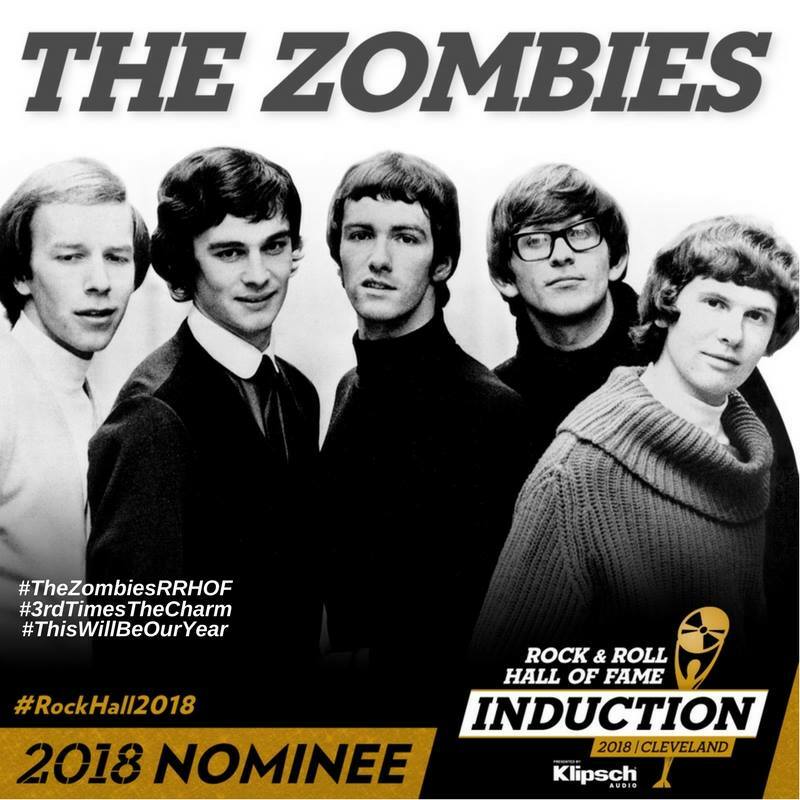 As noted by Patrick Ryan in USA Today, The Zombies, The Cars, MC5, Depeche Mode, and J Geils Band, are all back in contention after previously not making the cut. First time nominees Bon Jovi, Dire Straits, and Eurythmics are finally being considered, while Radiohead and Rage Against The Machine have been nominated in their first year of eligibility. It’s hard to pick, but I’m definitely rooting for The Zombies and The Cars. Martyrs’ on Lincoln Avenue has an eclectic four-act event coming up tomorrow night that looks like it will be a lot of fun. The Handcuffs, led by vocalist-guitarist Chloe F. Orwell and drummer Brad Elvis (who also performs with The Romantics), always a offer festive mix of originals and occasional well-chosen cover. Sci-fi rock outfit Tomorrow The Moon features the impressive Steve Gerlach (he’s also in the Sons Of The Silent Age David Bowie tribute act) on lead vocals and guitar. 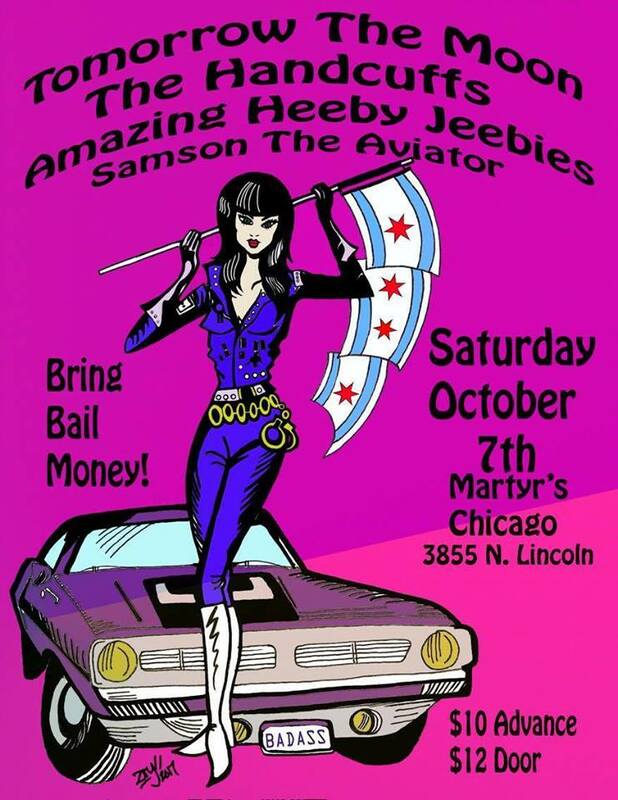 The Amazing Heeby Jeebies perform spooky rockabilly/garage rock songs that make every gig a Halloween party. Metric, the techno/rock band that has given us great songs like “Monster Hospital,” will be releasing a concert triple LP, Blu Ray, DVD package in March next year. Dreams So Real was recorded on the last date of its 2016 Lights On The Horizon tour. Autographed copies are now available for pre-order on the Pledge Music website. The Fab Faux will be performing A Hard Day’s Night in its entirety, along with other Beatles tunes tomorrow night atThe Vic Theatre. Phil Angotti and Friends will be celebrating John Lennon’s birthday on Monday, October 9 at Martyrs. Also at that same venue next week: The Vulgar Boatmen; Walter Salas-Humura from The Silos; and The Sunshine Boys on Thursday, and Expo ’76 with The Total Pro Horns with special guests Robert Cornelius and Susan Voelz on Friday. The 53rd Chicago International Film Festival runs from next Thursday, October 12 through October 26 at AMC River East 21, just north and east of the downtown area. In addition to screening movies from every imaginable genre and location, the event will offer tributes to Patrick Stewart of Star Trek: The Next Generation and X-Men fame, and iconic English actress Vanessa Redgrave. Regular screenings are $15, special presentations are $20, and there discounts for seniors or students, and multiple-show passes are available. The Laureates, a local band that has released a pair of full-length albums and recorded a number of interesting cover versions that could be downloaded from their website, will be at The Empty Bottle next Thursday, October 12. Rebecca Toon and Tommi Zender, will be performing Joni Mitchell’s entire Court And Spark album at Wishbone North on October 19 as part of the restaurant’s Third Thursday series. Zender arranged the songs for acoustic guitar. Ron Onesti, who’s been doing a bang-up job of bringing acts like Graham Nash, The Smithereens, The Romantics, Marshall Crenshaw, Steven Wright, Shoes, Pezband, Dwight Twilley, Off Broadway, and Micky Dolenz to The Arcada Theatre in St. Charles, has announced plans to create a Chicago Music Hall Of Fame. Honorees would stretch from the formative days of jazz and blues in the 1930s, through the folk and pop music of the 1960s, to more recents acts that have made Chicago proud. 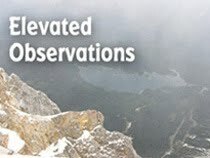 Considering Onesti’s organzational skills, it will be interesting to follow how this project comes along. Tom Petty’s sudden death earlier this week left fans and fellow musicians alike struggling to process the news. Several turned to social media to express memories of the terrific songs he recorded and the live shows he performed. Those who worked with him described him as always friendly and a class act. I first heard Tom Petty on WXRT in Chicago, and was inspired to buy his self-titled debut album. Tracks like “Breakdown” and “Roclin' Aroound (Witrh You)” are still regarded as classics today. I only saw him perform once, on a double bill with Elvis Costello at The Riviera Theatre in 1979, but it was enough to set me on a course of following his music throughout the rest of his career. Tomorrow The Moon, led by vocalist-guitarist Steve Gerlach (he’s also in the Sons Of The Silent Age David Bowie tribute act and was a long-time member of The Bad Examples), have released two EPs and a full-length album of imaginative and highly melodic sci-fi rock. Their live show is sure to be impressive. The Amazing Heeby Jeebies have established a loyal following on the club scene with fun rockabilly/garage songs like “Loupe Garou” and “Mummy” that make every gig a Halloween party. Martyrs’ is located at 3855 N. Lincoln Avenue, the show kicks off at 8:45 p.m. Admission is $12.00. 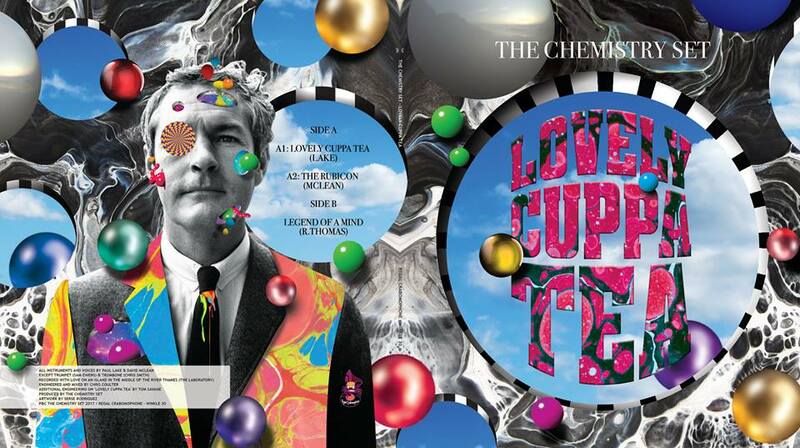 “Lovely Cuppa Tea” is a quintessential British pop song, brimming with clever rhymes about the magical powers of the title brew, and is set to a catchy arrangement. 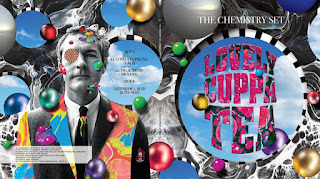 The high-energy and psychedelic “The Rubicon” protests against the current political climate while simultaneously proclaiming, “Let love shine bright into your day.” By covering “Legend Of A Mind,” The Chemistry Set returns to the subject of LSD after paying tribute to the drug’s creator on their own “Albert Hoffman” on The Endless More And More. It’s faithful to the original, but also adds its own touches, like a spoken word bit, and festive horns. It’s been almost two decades since Thrift Store Halo released its full-length debut World Gone Mad, which was an impressive collection of power pop tunes. The world has gone on during that time, and the Chicago-based trio seems to have made a conscious move toward what’s currently topping the charts. 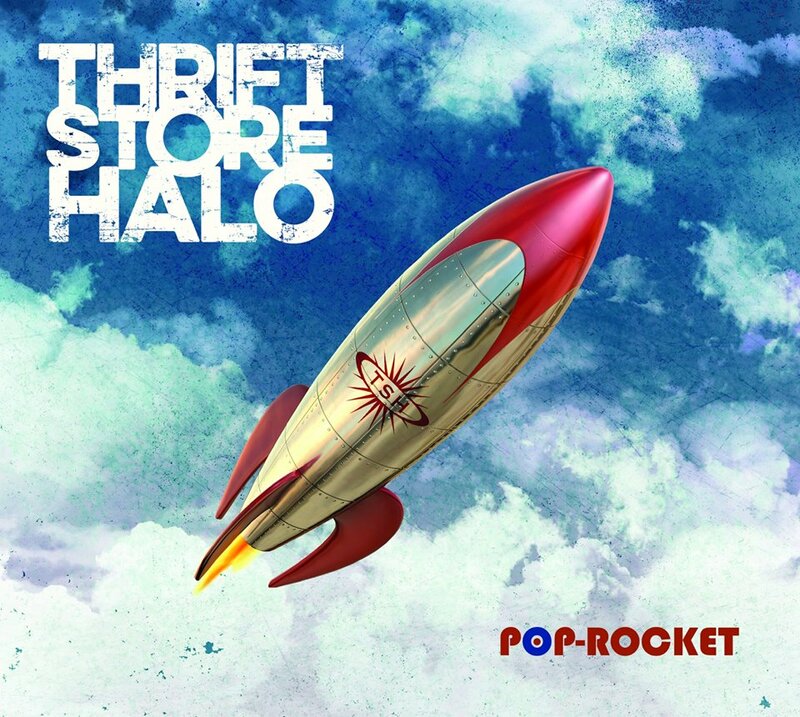 The six-song EP Pop-Rocket accomplishes that goal, although fans who still fondly remember World Gone Mad may be surprised by the alt-rock feel this time around. He’s just as believable on “Let’s Not Wait,” a celebration of discovering a new romance. The song’s more playful instrumentation is also a welcome change from the mid-tempo pace the dominates Pop-Rocket elsewhere. “Stay Away” also stands out; matching jabs like “Every time I’m near you I’m reminded you’re insane” with a guitar-driven, energetic arrangement.